It was fifty years ago today- Wednesday February 5, 1969- the Washington Redskins who hadn’t had a winning season in thirteen seasons- announced the ultimate fix- the hiring of Vince Lombardi as part owner- vice president, general manager and head coach. Lombardi was the legendary head coach of the Green Bay Packers from 1959-67. He took over the worst team in the league in Green Bay and won 5 NFL titles and the first two Super Bowls in his 9 years with the Packers. After Super Bowl II’s victory over Oakland he stepped down. They didn’t use the term back then but he was burnt out. He spent 1968 as the Packers general manager but found not coaching made him restless. The word was out that Lombardi was looking to return to the sidelines and the Philadelphia Eagles, Boston Patriots were interested but the Redskins President Edward Bennett Williams made the big move- offering Lombardi a part ownership 5 %- of the team. It was an interesting winter of 1969 in Washington D.C with a new President in Milhous Nixon- in late January the Washington Senators had hired Ted Williams as manager and now the biggest news of all- the greatest coach in the history of the sport- was coming to town to turn around the Redskins. 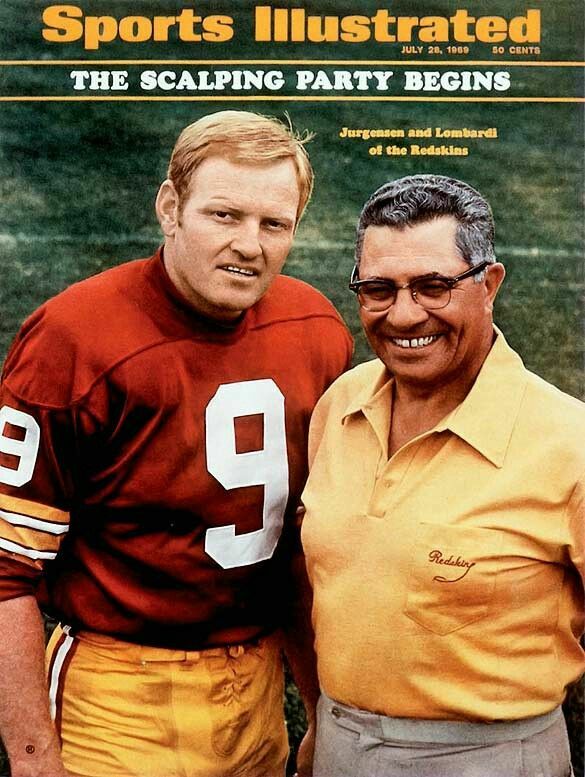 In the last week of January -first week of February 1969 some pretty impressive hire’s in the NFL- two unknowns who got jobs- The Steelers hiring Chuck Noll and Raiders hiring John Madden- both became Hall of Fame coaches- and then the Redskins in Lombardi. A good bet that in the recent NFL head coaching changes- there are no Noll’s- Madden’s or Lombardi’s in the bunch. Lombardi was 55 years old when he became the Redskins head coach. Sadly he only got to coach one season- in 1969 they broke that run of bad seasons with a 7-5-2 record. Things were looking up- but Lombardi was diagnosed with an aggressive form of colon cancer in early 1970 and died on September 3, 1970 at 57. 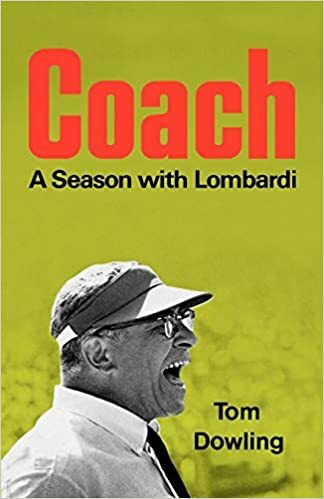 A pretty good book- long out of print on Vince Lombardi’s season with the Redskins- Tom Dowling’s book- Coach- A Season With Lombardi. How great of a coach was Lombardi? They named the Super Bowl Trophy the Lombardi Trophy in his honor. Many consider him not only the greatest NFL head coach but possibly the greatest coach in American sports history. There were great football coaches before him and during his time but the name Lombardi is remembered above all the others. 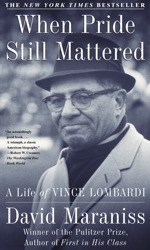 A great book on Lombardi which I have read a few times is David Maraniss- When Pride Still Mattered- A Life Of Vince Lombardi- which came out in 1999. One of the best sports biographies I’ve ever read. Lombardi was a fascinating character. I have read every Lombardi book I’ve seen out there over the past 50 years- I am a huge fan of his- but I must admit that the title of greatest NFL coach- and greatest American sports coach ever has probably passed on now to Bill Belichick. I know it’s not important in light of what happened but I have to wonder how good the Redskins would have been if he would have lived. He is one coach I’ve never read much about. It is hard to say- they improved in his first season.. George Allen took over in 1971 and they made the playoffs his first season- and the super bowl the second season- of course Allen made a ton of trades that Lombardi may not have made. I think it is probably unlikely Lombardi would have built the dynasty like Green Bay- 5 titles in 7 years is kind of science fiction. I would bet he would have done well though. I need to read some about him. I’ve heard stories from his players and that is about it. Off topic…well it doesn’t look like Brady or Belichick will retire after winning it. Some guys are happy- Cowher- Dungy come to mind- finally winning their super bowl. As a Steeler fan it was obvious the season after the Cowher Steelers won it that he didn’t have the same passion- and it was no shock to anyone when he retired. He achieved his goal. Belichick and Brady are like crack addicts- they can’t get enough- back next year for another go round. I would not be surprised if Gronk retires though -his body has taken a beating over the years. …. I think the big thing on Lombardi is the influence he had on the lives of his players- after their careers were over. lol ….Brady will be 42 but I guess if he can stand protected in that pocket and pass he can continue…the both of them own or will own almost every record in the book. The one thing I heard about Lombardi was he was tough but fair…like a father at times…and that makes sense after what you said about his players after football lives. I have read a lot about Lombardi and those Packers- the first adult book I ever read- was Jerry Kramer’s diary of the 1967 season- Instant Replay….. I think the players at times hated Lombardi when they played for him he was so tough- but they certainly respected him and after it was all over- saw his wisdom. When so many fellas say that they wouldn’t have had the success they had in life without the lessons they learned from him- that says something. . I think it was Willie Davis who said- he loved his father but he doesn’t think of him every single day- but he thinks of Lombardi every day. That last bit says it all… Those older coaches wanted them to be good men first and then the football would come…They knew they would have a true team that way. True teachers. I wonder what coaches of recent times have had a big impact on their players? I would guess Tony Dungy did for one. That is a good question. Since football is such a big business now it’s had to change the dynamics of how close they get. It has to be harder these days. There is a barrier of money. Lombardi would not have put up with Pacman Jones…I don’t think… and he would have sent him packing but with the money now you can’t do that as easy. Dungy seems like a great human being so I could really see that with him. Also players change teams so often today- in all sports. If you have a star quarterback he is staying put but with with salary cap etc- players go from team to team- years ago not as often. .. I think your right- Lombardi wouldn’t have kept Pac Man around too long.. I didn’t think of that but you are right…there are not many constants anymore in sports personnel…also sad to say I don’t know if the temperaments of today’s sports players would take the advice. I’m sure some would…I shouldn’t make a general statement but it is different than it was before. The times have changed. Lombardi’s ways of coaching would also have to change in today’s atmosphere. He was a smart guy who knew how to work different personalities- I am sure he would have adjusted. And yes I agree about players of today compared to 40- 50 years ago- more money and changes in temperment. I can’t imagine Antonio Brown’s act going over with Bill Belichick. I agree Lombardi would have adjusted. Of course we can’t drop someone out of their time into ours… (but I would love to with Billy Martin just for a week! excitement)… The great ones could adjust. I say the same thing when I hear people say Babe Ruth couldn’t hit today…I tell them yes he could because he would be in our world and would have the benefits of today’s ways of training. His baseball skills would be there…he wouldn’t use a 40 inch bat but he would adjust. I agree- he would have all the benefits of today just like the players today have. I would have loved to have seen him play. There can’t be many people left who actually did. My goodness… his step-daughter is still alive at 102 Julia Ruth Stevens. Not many I’m sure. I will look for that book about Lombardi… Hans thanks. Your welcome- its still in print- shouldn’t be too hard to find out there. .. He last played 84 years ago.. there can’t be many who saw him but a few.. I recall the story of former Supreme Court Justice John Paul Stevens being at the called shot game in Chicago. Stevens is 98 now. Lombardi wrote a book Run to Daylight where he describes the preparation for, and playing of, a professional football game in the 1962 season. I read that one probably 40 years ago- a great read. I think there was also a documentary made back then on that. I seem to remember seeing it once. Following Lombardi thought the week.